One of the things I’m still craving after our McDonald’s Blogher trip over last summer is Southwestern Chicken Salads. The Chicago on campus McDonald’s had the best McDonald’s food I’ve ever had. It was practically five star compared to our local McDonald’s or any other McDonald’s I’ve ever been to (not that we frequent McDonald’s that much). My son even asks regularly to go to Chicago McDonald’s. Notice I didn’t say the McDonald’s down the street. I understand how passionate the big wigs were we talked to were about their restaurant because they only eat at the best. So to fulfill my cravings for the perfect Southwestern Chicken salad, that would require either moving to Chicago or a very expensive plane ticket every time I got a craving, I decided to make my own Sante Fe chicken salad version. I used mostly fresh ingredients, and I’m happy to say that my salad is even better than the Chicago McDonald’s Southwestern Chicken salad. I did use canned corns and black beans to save time. I even found a can that already had the corn and black beans mixed together. I added lots of spices to the chicken in the form of a rub before grilling it, and made a delicious dressing. This dressing really makes this salad. It has honey, lime, sour cream and lots of delicious spices. 1. Combine all ingredients for salad in a large bowl, or on salad plates. For chicken, combine all spices in a little bowl, and sprinkle on both sides of chicken breasts. Preheat grill or skillet, Drizzle or brush with olive oil and cook until done. 2. For dressing, combine all ingredients, except olive oil in a large bowl. Whisk well. Drizzle in olive oil very slowly while whisking. Continue to whisk and drizzle slowly until all oil is incorporated. i love, love, love restaurant knock-offs!! and it beats a plane tix to Chicago too!! This sounds so good and I know my family would love it! Stunning photo, love the green in the background…perfect! This chicken salad looks awesome! Great photo girl, makes me want to dive right in. The dressing sounds great too. Yum! While I haven’t had Mickey D’s version, I am SURE this is better. 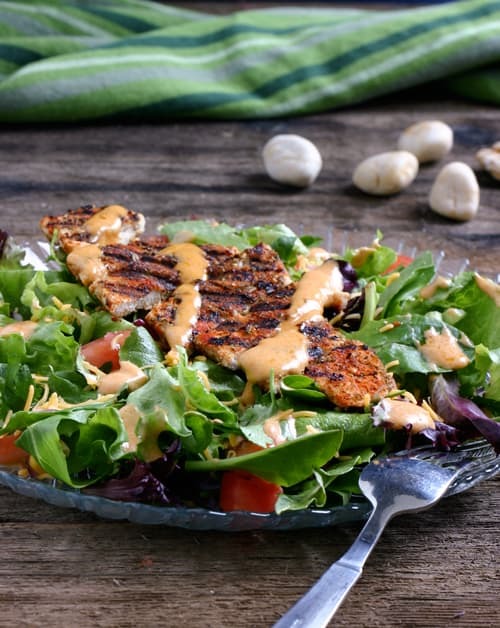 I LOVE southwestern chicken salad, this looks wonderful! There is no doubt in my mind your salad is 100 times better than the best McDonald’s evar. Your dressing is very intriguing– Must try! Thanks, Angie! Just the word McDonald’s does me in. The photo looks amazing. This looks so good, perfect for an evening dinner. Your dressing sounds fabulous. Creamy and tasty. YUM!